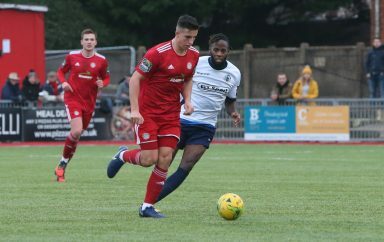 A listless display from an out-of-sorts Worthing saw them cling on to the last play-off place by a single point, as a dominant home team exposed the flaws of a side with no plan B.
Alex Parsons returned from suspension in place of Kwame and Joe Clarke did a straight swap with Ross Edwards. While Bishop’s Stortford were only able to name two subs after George Craddock twinged his thigh in the warm-up. The hosts attacked from the off, with Lucas needing two attempts to hold on to Ryan Charles’ shot after a neat backheel by Jamie Cureton had released him into the area. Ricky Aguiar sent over a free-kick from the left that was too high even for the towering Jalen Jones and Alfie Young needed to have his wits about him to prevent Cureton setting up Ben Worman. A blocked shot from the subsequent corner, another warning. 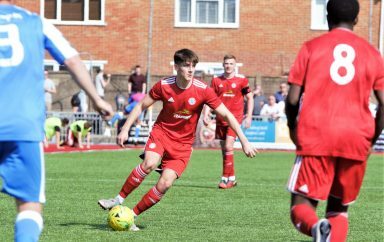 Worthing responded through David Ajiboye but his mini-run culminated in a weak finish, before Parson’s foul on Shadrack Ogie lead to Alfie Mason’s set-piece being floated towards the back stick, where Ryan Henshaw beat his Captain, Sam Robbins to the ball but couldn’t keep his header down. Cureton flashed another dead ball across the box and past the far post, as the Hertfordshire hosts looked to close in on the play-offs. The breakthrough finally came just shy of the half-hour mark, when Joel Colbran’s attempt to clear the danger resulted in him, somewhat unfortunately, almost launching Leyton Orient loanee, Ogie into the stand instead. Player Joint-Manager, Cureton blasted home the spot-kick high into the net; Covolan going the right way but left with no chance of stopping it. Some neat approach work saw Callum Kealy receive Aguiar’s short free-kick near the ‘D’ and play in Parsons, making headway down the right. Unfortunately, his driven cross into the box only found the hands of the largely underemployed, Arthur Janata. Jesse Starkey seized on a loose ball and fired an ambitious effort over the bar; as the misfiring visitors continued to struggle up front. One promising move started with Colbran sending Ollie Pearce scampering clear down the right-hand touchline, where he did well to keep the ball in and find Ajiboye, who came inside Johnville Renee and forced the only save of the game out of Janata. The ‘keeper showing good reactions considering he’d spent most of the first-half in the hammock he’d had time to put up across his goal. Ajiboye featured again a short time later, teeing up Joe Clarke for a centre-half’s finish. Five minutes into the second period, Lucas had to push Cureton’s inswinging corner over the bar then, after nearly an hour had gone by, held on comfortably to Charles’ attempts to double his sides’ lead. After losing the ball to Ben Worman for that last chance, Starkey had time and space to get in a decent shot from Kealy’s right wing pass, only to send it wide of the target. Something he’d almost found moments beforehand, when his “cross” had briefly diverted planes flying out of Stansted before falling back to earth and bouncing off the top of Janata’s crossbar and behind. Worthing looked shaky at the back all afternoon and Storford sensed this nervousness. 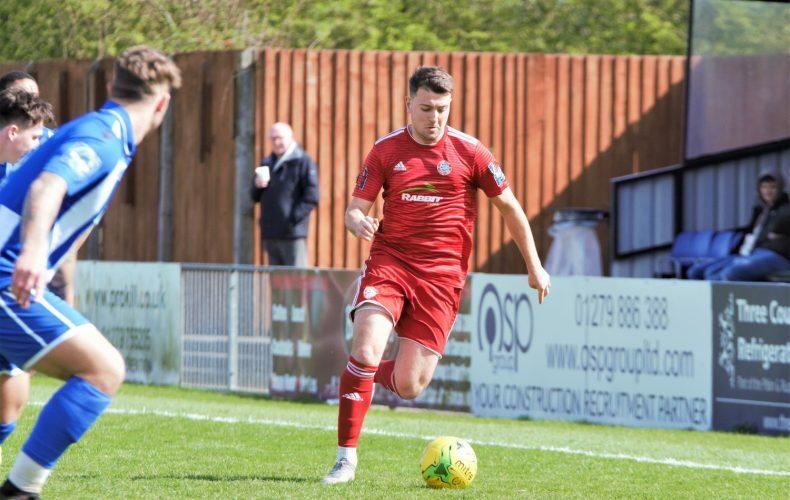 Particularly, twenty minutes from time, when Worman, Alex Warman and Charles combined for the latter to put the ball behind, from the left side of the penalty area. More indecisiveness lead to a bout of head tennis that resulted in Worman missing by a small margin, after the ball dropped to him in the box. Substitute, Darren Budd got in the way of Charles’ powerfully struck drive but then took down Ajiboye’s header, only to shank his shot to the corner flag. Parsons recovered the situation and crossed for our number seven, to head over the top. With time running out, Cureton delivered his flag-kick all the way to the feet of Ogie, outside the area and the teenage full-back spanked a low effort marginally inside the right-hand upright, despite Covolan getting a hand to it, for his maiden Stortford goal. The outcome was put beyond any reasonable doubt seconds later, when Cureton – on his 999th career appearance – blasted past/through Lucas at the same piece of apparatus, (Charles taking credit for a lovely turn and pass across the six yard box), to make it 359 in the onion bag over a long career that shows no signs of slowing down anytime soon. 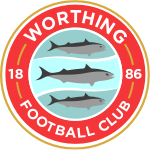 Worthing had little to add; Clarke’s blocked attempt in The Blues’ box a weak riposte, as a dominant home team comfortably saw out the remaining minutes, to seal a fourth clean sheet in five matches and maintain their late push for promotion.